A modern twist on the traditional white potato gnocchi, we’ve chosen to use sweet potato to add colour and sweetness to this dish, and to fry the gnocchi for extra bite. 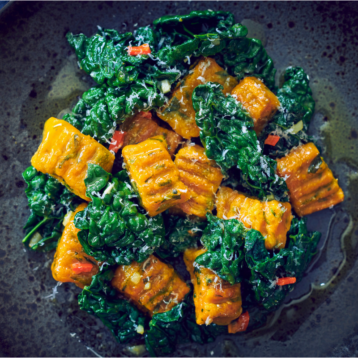 Served with cavolo nero (also known as the ‘Tuscan kale’), this recipe is a delicious way to pack two nutritious vegetables into your meal. Preheat the oven to 200ºC, line a roasting tray with baking parchment and place the sweet potatoes in the oven for 40-50 minutes until tender. Remove when cooked and leave to cool. Wilt the spinach in a pan with a little water and leave to cool in a sieve. Squeeze out excess water, coarsely chop and set aside. When cool, halve the sweet potatoes and scoop the flesh into a large bowl. Mash until smooth, add the chopped spinach, egg yolks, salt and mix well. On a floured surface, divide your dough into 4 and roll each portion into a log about 1.5cm thick. Cut into individual pieces around 2cm long. Once shaped, place on a tray and then into the fridge for about 30 minutes to firm up. Bring a large pan of salted water to the boil. Add the cavolo nero and boil for 3-4 minutes. Remove and leave to cool slightly – keeping the water. When cooled, roughly chop. Remove the gnocchi from the fridge. Gently place the gnocchi into the water and cook until they rise to the surface (should take 2-4 minutes). Cook these in batches so they don’t stick together; then, using a slotted spoon, remove the gnocchi from the pan and onto a cooling rack to dry. In a large frying pan, cook the garlic in Filippo Berio Classico Olive Oil on a low heat for 2 minutes. Add the chilli and cook for a further two minutes. Add the gnocchi to the pan and fry until lightly coloured. Add the cavolo nero for 1-2 minutes to heat through. Serve with grated Parmesan, fresh black pepper and a good drizzle of Filippo Berio Extra Virgin Olive Oil.